Our lives revolve around relationships. A happy relationship with our Maker, partner, family, or friends doesn’t just come about. 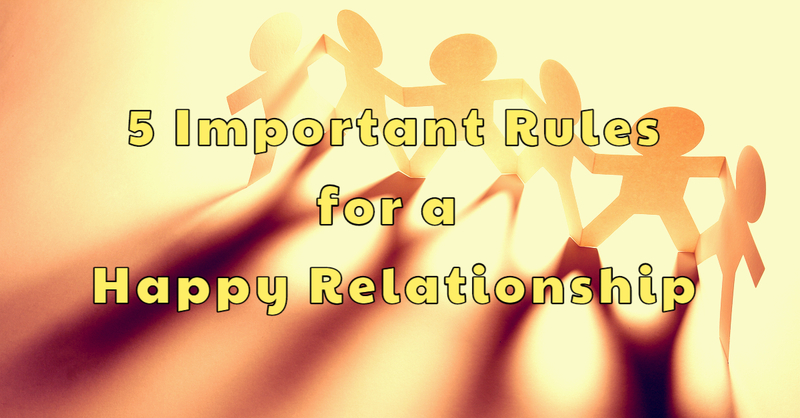 There are important rules for a happy relationship to happen. As relationships are a huge part of our everyday, it’s necessary to keep it healthy. A happy relationship needs hard work. It takes effort on both sides to keep it healthy. Some people end up sabotaging their relationships without knowing it. And when they realize, it’s too late. As long as there is mutual respect, there is harmony. As long as you respect the other person, there will be peace even when you don’t always agree. When you respect someone, you will not do anything to hurt their feelings. With respect present, there will be equality, there will not be hurtful words thrown at each other, and there will be consideration. It will be easier to accept that not everyone is the same. People involved in respectful relationships are generally happy. Whether it’s your spouse, children, friends, or parents, it’s important to make time for the relationship to grow. Always make time for prayers to grow your faith and relationship with God. Aside from family time, schedule a date to spend quality time with your partner and each of your kids. Find time to see or at least chat with a friend. Visit your parents. Relationships die when you fail to nurture it with time. Spending time with the people in your life is one of the most important rules to follow for a happy relationship. Rick Warren said it best: “Time is your most precious gift because you only have a set amount of it. You can make more money, but you can’t make more time. When you give someone your time, you are giving them a portion of your life that you’ll never get back. Your time is your life. That is why the greatest gift you can give someone is your time. Once in a while, try something new together. Visit a new place and explore together, watch a movie you haven’t seen yet or a movie with a different genre and discover arts together. Try a new hobby. You don’t even have to try a hobby together as being diverse gives you something to talk about. Thus, making you look forward to conversations. You can’t control the other person. It could get suffocating when parents practice helicopter parenting. When your partner becomes too involved in your life, it can make you lose your sense of identity. It will make you feel as if your privacy has been invaded. This could sabotage any relationship. Give others the time and freewill to do what they want. Allow them to learn on their own. Let the other person grow as an individual so they could contribute better to the relationship. It takes a mature, whole, happy person to make a happy relationship, and not the other way around. Never forget and underestimate the power of humor. If you can laugh at your own mistakes, and laugh with each other, of course it’s bound to be a happy relationship. Life is not always about rainbows and butterflies. There will always be storms, bumps along the road, reroutes and dead ends. You need people in your life that will make you see the light no matter how dark it may seem. A happy relationship happens when the people involved choose to make it happen. Choose humor. Laugh often. There are many rules in life. Rules don’t bind us or strip us of our freedom. On the contrary, rules guide us so we can enjoy life more and avoid unnecessary stress. Same is true with relationships. There are important rules to follow. For a happy relationship to happen, don’t just wish for it to happen. Work on it, and revel in its fruit. Do you have any rules you’d like to include? Laugh often is my mantra now a days. Great pointers to ponder for happy relationship. Thanks Corinne !!! Very important to remember and follow. Really true Corinne. The quote by Rick about time is an eye opener. These days, parents are very busy earning and not spending time with their kids. I was looking for #MondayMusings post. Is it not live yet? Hi Ramya – Glad you liked this. Sorry my #MondayMusings post got delayed. I hope you found it.